This web page is to illustrate and describe flowers we see on Honeyguide's Extremadura holidays that are tricky to find in field guides. Photographs are all taken in March (various years). The best flora for Extremadura, generally, is Mediterranean Wild Flowers by Marjorie Blamey and Christopher Grey-Wilson (originally HarperCollins, now Domino Guides published by A & C Black. ) This page concentrates on flowers that are not in Blamey & Grey-Wilson. A few are in Flowers of South-west Europe by Polunin & Smythies (Oxford), here abbreviated to Polunin, though some are described but not illustrated in this book. Linaria amethystea (right), for which the English name of amethyst toadflax has been coined. It may look obvious here but it's the tiniest of flowers, usually often on disturbed ground, such as in the olive orchard at our base at Finca Santa Marta. 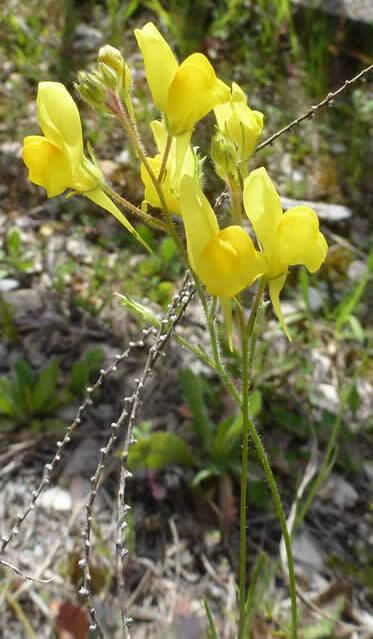 Linaria spartea (left, no English name) is another toadflax and is fairly common, often on dry roadsides. In contrast to Linaria amethystea, this is medium-sized - about knee-high. The tall, thin stems make it a challenge to photograph unless there is no wind. 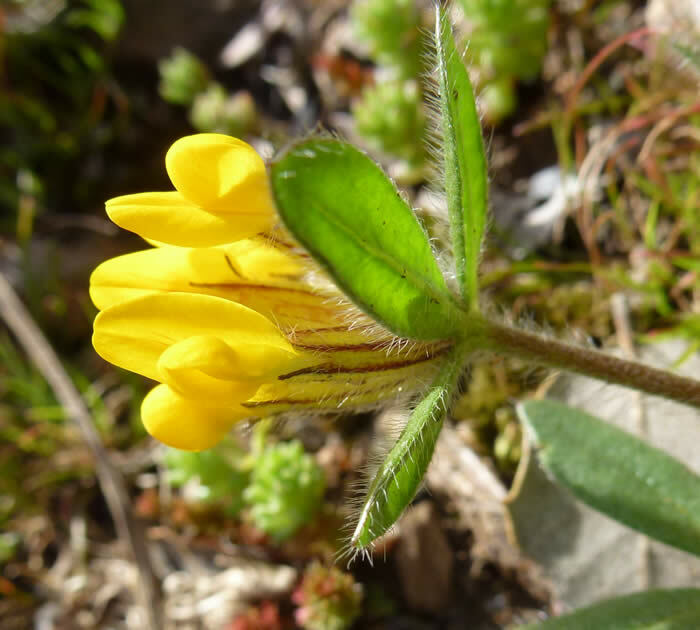 This pea is Anthyllis lotoides, which roughly translates as 'kidney vetch that looks rather like a birdsfoot trefoil.' Can be found as an individual plant or as a patch, such as these on a roadside near Trujillo. The stripes on the calyx are a good feature. Onobrychis humilis is another pea, in the cockscomb sainfoin genus, but chunkier than the related species we see on Crete. It looks obvious but again isn't in the books. 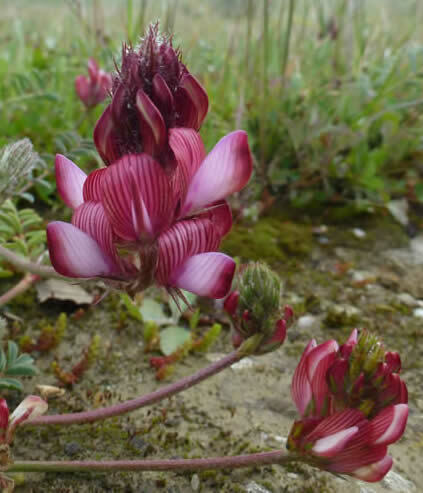 Its spreading growth form, here by a track on the plains around Santa Marta de Magasca, is distinctive. Strapwort Corrigiola litoralis is a tiny member of the pink family, found on disturbed ground e.g. tracks in steppes. A useful tip in Extremadura is that ruderal species may be in north European flower guides: this is in Fitter-Blamey-Fitter. Other examples are the abundant crucifers tall rocket Sisymbrium altissimum and wild radish Raphanus raphanistrum. 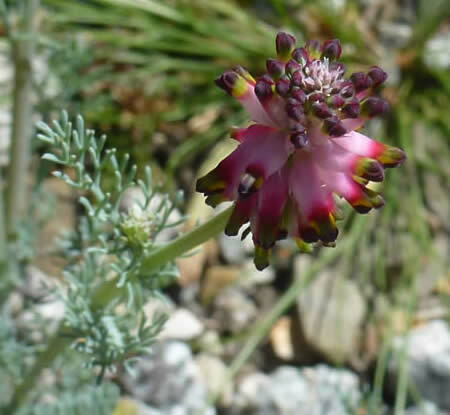 This Jasione crispa - dwarf sheep’s bit - is growing among the lichens at Cabañas del Castillo in the Villuercas mountains. It's illustrated in the alpine flora. Spanish cheilanthes Cheilanthes hispanica grows here too. Spiked fumitory Platycapnos spicata was at the heath above Madroñera on 15 March 2017, a new flower for me. It's mentioned but without a photo in Polunin. 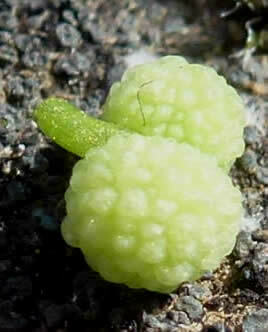 Identified with the help of Flora silvestre del Mediterráneo. Galium verticilliatum is in Blamey & Grey-Wilson but included here as this bedstraw (no English name) is so tiny that it's easily overlooked. The best feature are the globular bumps on the seeds, here much magnified. The leaves with it are Arisarum simorrhinum, an Iberian friar’s cowl. The Galium shown here is on a wall at Monfragüe castle. The stock Matthiola lunata - it is pictured in Polunin - is best seen at Finca Santa Marta. 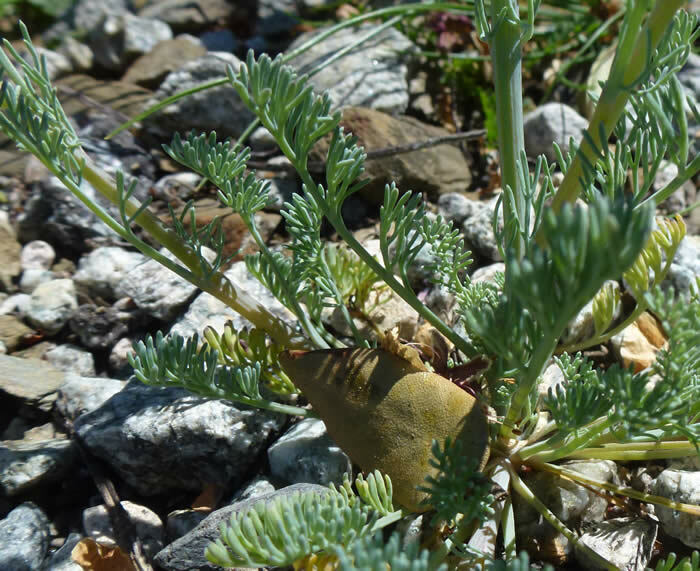 Spanish adenocarpus Adenocarpus argyrophyllus is endemic to Extremadura and in neither book. This shrub pea is on the rocks in Monfragüe National Park. Ornithogalum concinnum grows in small groups in the granite outcrops north of Trujillo. The green stripe on the underside of the tepal is like other star-of-Bethlehems, yet that disappears as the flowers open and can be overlooked. Line drawing only in Polunin. Lamium bifidum is easy once you know it: the white stripes on the leaves of this dead-nettle are distinctive. It grows at Finca Santa Marta. Green-flowered birthwort Aristolochia paucinervis. Occurs at Finca Santa Marta but this was at Huerta Grande, our base on our Tarifa holiday. Champagne orchid Orchis champagneuxii. See also our Iberian orchids web page. Photos and text by Chris Durdin, October 2014.